Articles written by Joan Adler. Edited, formatted, and published by Joan Adler for the Straus Historical Society, Inc. This newsletter contains an article about Kenneth & Egon Maas' experience during WWII as well as an article about Hannah Greenebaum Solomon. Smaller articles include an Introduction to the Society's New Intern, the Publication of Disease in Milk, the Society's November 2015 trip to Georgia, a List of the 2015 Donors, The Restoration of the Straus Family Mausoleum at Woodlawn Cemetery, and Friends of Straus Park Updates. 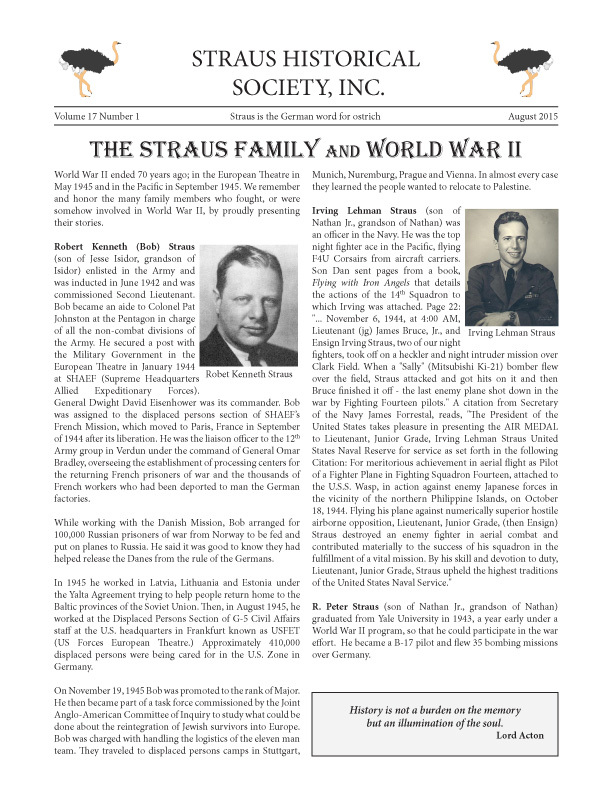 This newsletter contains an article about the Straus Family and World War II. Smaller articles include the Society's May 2015 trip to Chicago, 2015 Presentations, From our Archives, an Obituary for Buddy Elias, the Publication of Disease in Milk, and Documentaries and a Ph.D. Thesis. To read more of the SHS Newsletters, visit the Newsletters page in the Archive section of the Straus Historical Society's website. Joan Adler has written numerous articles that have been published and re-printed in many scholarly journals. For more information about these works, please contact Joan.